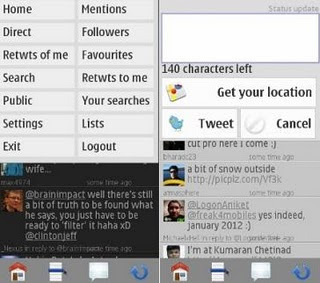 TwimGo by Tommi Laukkanen is a free Twitter client app for Nokia touch device (Symbian S60v3 S60v5 Edition & Symbian^3). TwimGo is WRT Based Twitter client and originally created for Nokia N900. With TwimGo, you can easily to retweet reply, and mark as favourite. You can also search nearby tweets. TwimGo support for different timelines, home, mention, DMs, Favourite, lists, searches, etc.., Landscape mode shows tweets in grids. TwimGo app also supports List and saved searches. If you?re a twitter user, this app is a must-have.